Dignity and Defiance is a powerful, eyewitness account of Bolivia's decade-long rebellion against globalization imposed from abroad. Based on extensive interviews, this story comes alive with first-person accounts of a massive Enron/Shell oil spill from an elderly woman whose livelihood it threatens, of the young people who stood down a former dictator to take back control of their water, and of Bolivia's dramatic and successful challenge to the policies of the World Bank and the International Monetary Fund. 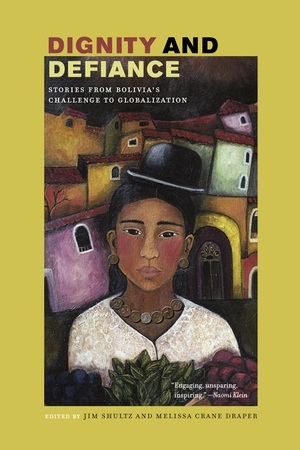 Featuring a substantial introduction, a conclusion, and introductions to each of the chapters, this well-crafted mix of storytelling and analysis is a rich portrait of people calling for global integration to be different than it has been: more fair and more just. Jim Shultz is Executive Director and Melissa Crane Draper is Assistant Director of the Democracy Center.